Photo courtesy of Carmel Arts and Design District. The Indianapolis area has a lot to offer, but like so many residents, I find that it’s easy to ignore the attractions and programs offered within my own backyard. For years I’ve heard about Carmel’s Arts and Design District but I never found time to go. Strolling through this delightful neighborhood, I discovered that not only is it full of the great art I expected, it’s also full of fun shops and eateries. 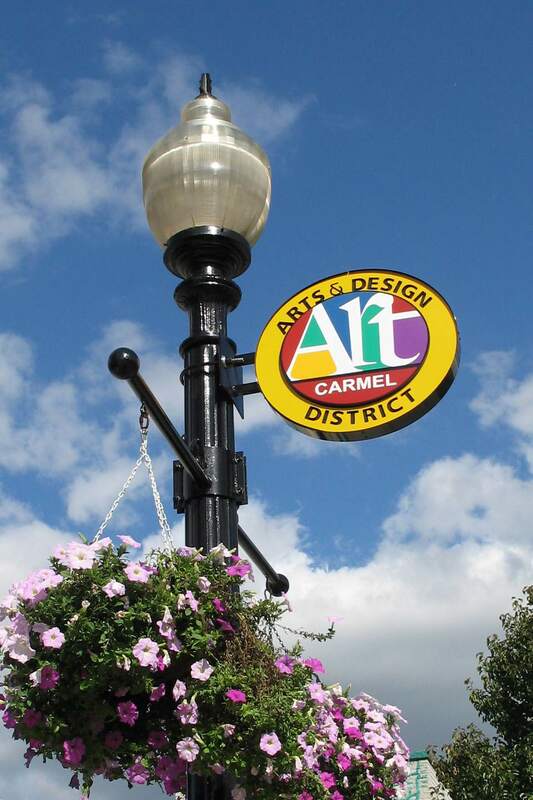 For a leisurely stroll, the Carmel Arts and Design District is a must. The majority of the district is located off of West Main Street in Carmel. If traveling from Indianapolis, go north on Meridian Street (US Highway 31). Turn right at 131st Street by the Hilton Garden Inn. This street will become Main Street. Travel about a mile and a half to the center of the district. Parking is located along the streets as well as behind some of the shops and galleries. Here are some directions to assist you. Throughout the Carmel Arts and Design District, there are several sculptures by artist, J. Seward Johnson. Jr. Each one is beautiful, lifelike and has amazing detail. You won’t want to miss one of them, so throughout this walking tour, I will highlight their locations. J. Seward Johnson Jr., has created over 250 life-size bronze sculptures throughout the world. He is the grandson of the founder of Johnson & Johnson Company. He began his career in painting but switched to sculpting later in his career. The sculptures featured throughout the district are from the “Man-on-the Street” collection which he began creating in the 1980s and continues to create. For this tour, we begin at the west entrance of the Carmel Arts and Design District at Main and Third Avenue NW. Directly on your left is Shiraz Wine Café. Outside Shiraz, is the first of the J. Seward Johnson Jr. sculptures that are scattered through the Arts District. This one features a painter, painting the entrance to the district. Next and also to the left are the Soori Galleries I and II. The Soori Gallery features paintings, bronze and acrylic sculptured works. Outside the Soori is a beautiful bronze statue of a woman gathering flowers. Bub’s Burgers is on the left at the corner of Main and Second Street NW. Beside Bub’s is a sculpture of a police man, directing traffic. The sculpture entitled, Oh, It’s You, Welcome is directly beside the Monon Trail. This intersection is often busy with walkers, joggers and bikers who take the trail every day. Signs caution drivers to stop for pedestrians before continuing on through the intersection. Across the street from this sculpture, and right along the Monon, another sculpture greets visitors. First Ride depicts a father pushing his daughter on her bike for the first time. This block of the Arts and Design District has four galleries. On the right or the south side of the street, there are three. The first gallery is the Eye on Art Gallery. This gallery features both established and new artists and often, the artists are available to discuss their works. Exhibits change monthly and include a variety of mediums. Beside Eye on Art is French Bleu Fine Art Gallery. French Bleu showcases the paintings of artist Susan Mauck. Mauck’s impressionistic art work includes portraits, figure and landscape paintings. Abstract works by Nikko Minichiello are also displayed in the gallery. Outside French Bleu is the next Seward sculpture. The sculpture is a man sitting on a bench reading a newspaper. Entitled, Confirming Predictions, the sculpture is so real it would be easy to pass by without noticing it. Beside French Bleu is ArtSplash Gallery. ArtSplash works offer a wide variety of styles from traditional to contemporary and specializes in unique and budget-friendly pieces. Along the same side of the street is a sculpture featuring an elderly woman holding onto a bag of groceries and other shopping bags. This sculpture, Holding Out is located outside Joe’s Butcher Shop and Fish Market. Across the street, on the north side of Main street is the Evan Lurie Gallery. Evan Lurie has a heavy emphasis on the contemporary abstract, with a strong focus on realism and neo-realism. The gallery features works in all mediums and sizes from small to three-dimensional sculptures. Over 40 artists are represented in this large gallery. Beginning at the intersection of Main Street and Rangeline Road and heading east, there are several more galleries in addition to the restaurants and shops that line the streets. On the south side of the street, the first gallery is Renaissance Fine Art & Design, followed by garvey/simon ART ACCESS, and finally, Magdalena Gallery of Art. Renaissance is owned by award winning artist and designer, Kathleen O’Neil Stevens and features original works of over 35 artists. Garvey/simon ART ACCESS specializes in educating clients about the world of art. Pieces there range from blue chip prints to studio furniture. Magdalena Gallery of Art features a large selection of regional, national and international contemporary art. Near these three studios is another sculpture you won’t want to miss. Appropriately placed, Unconditional Surrender is located right outside of lingerie shop Pillow Talk. This beautiful sculpture features a sailor kissing a young woman passionately. There are several more sculptures sprinkled throughout the district on side streets that are worth seeing in addition to other shops and restaurants. In order to get the most out of your tour of the Carmel Arts and Design District, you might want to take advantage of the gallery walks that are offered every second Saturday between 5:00-10:00 p.m. These walks are different every month and give a lot of insight into the different galleries and art on display within.